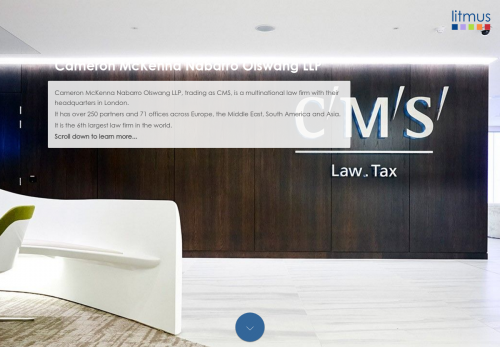 Cameron McKenna Nabarro Olswang LLP, trading as CMS, is a multinational law firm with their headquarters in London. It has over 250 partners and 71 offices across Europe, the Middle East, South America and Asia. It is the 6th largest law firm in the world. CMS engaged Litmus to work with its procurement and facilities teams to manage the catering and hospitality tender for its prestigious London office in Cannon Place and its other UK offices. During the tender CMS Cameron McKenna merged with Nabarro and Olswang, but the decision was taken to continue with the tender and to build the revised requirements into a second stage in the process. Est mi maximus mi, sit amet lobortis magna lectus fermentum metus. Nullam interdum pulvinar urna eget feugiat. Vivamus ut magna lectus. Nunc elementum ut ante at pretium. Donec a luctus lectus. In sit amet arcu sem. Pellentesque eget felis rhoncus, eleifend nisi eu, imperdiet lacus. Aenean ac mauris vel nisl aliquam mollis.Maecenas fringilla, velit id maximus malesuada, est mi maximus mi, sit amet lobortis magna lectus fermentum metus. Nullam interdum pulvinar urna ege. To understand how workplace food services were likely to develop over the next five years and how this would influence the staff restaurant and café services within CMS – bidders had to demonstrate how they would ensure that the staff food services at CMS kept pace with these developments.